What makes a supergroup super? From Crosby, Stills, Nash and Young to Audioslave, bands, fans and the music press alike have generally leaned on the individual star power of band personnel to make such calls without much regard to such outfits’ actual output, meaning the Traveling Wilburys’ widely-panned second album holds some kind of cultural bond with the widely-acclaimed debut from The New Pornographers, even though the unprecedented composite fame of the former couldn’t create music to match the general excellence of the latter. 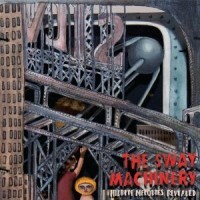 Borrowing players from the Yeah Yeah Yeahs, Arcade Fire, Antibalas and Balkan Beat Box, the debut from New York-based The Sway Machinery is less a synthesis of any of those bands’ output and more a diversion from them. Jumping between furious horn-accented stomp beats and echo-chamber spoken word, Hidden Melodies Revealed aims for just that: unearthing the musicality and melody of material not usually canvassed for either element, in this case the canon of Jewish prayer. While the Cantorial works from traditional synagogue songs act as the lyrical driver for Hidden Melodies Revealed, the music has more in common with modern free jazz and funk. Throughout the album, the horn lineup of Colin Stetson (bass saxophone), Jordan McLean (trumpet) and Stuart Bogie (tenor saxophone) act collectively as the lead instrument, their arrangements bursting with the kind of cool confidence and swagger usually not seen outside of 1950s New York City. On the heavy blues of “Tell It All to Me,” the trio hold down the low end beneath guitarist, vocalist and group mastermind Jeremiah Lockwood’s winding guitar line; on the epic dirge of “Adiray Ayumah,” the three indulge in more subtle flourishes while Lockwood revels in swamp-rock solo heaven. On three occasions, The Sway Machinery take a break from their meditative alt-funk by turning to actual outright meditation on the spoken pieces of “When I First Came to This Country,” “The Mask” and “The Princess,” each narrated by Lockwood, each reflecting on some combination of life, death, love and music. Thematically each makes sense alongside the highly spiritualized nature of the album, but the three pieces (while quite entertaining and smartly voiced) crush nearly all the momentum built up in the preceding tracks and come off as more emergency brake than stylistic detour. Adventurous missteps aside, the success of Hidden Melodies Revealed stems not just from the forward-thinking ideas of Lockwood, but from the group’s almost aggressive commitment to making a sound as heavy as its inspiration. “Super” may be a stretch, but say hello to the world’s newest interestinggroup.